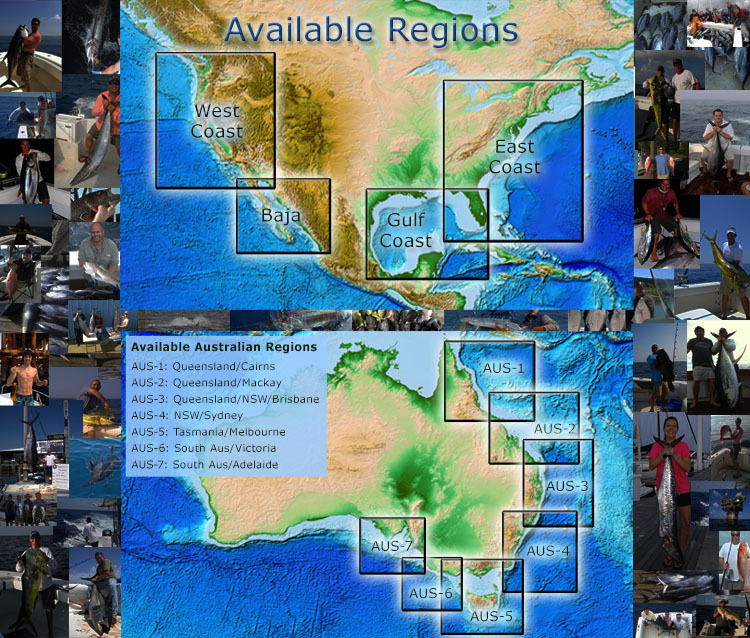 Sea Surface Temperature Maps, Chlorophyll Maps, True Color Maps, Surface Current Maps, Altimetry Maps, and Bathymetric Maps for the United States, Baja, and Australia. Navigate on your mobile device: Take the maps you see online with you offshore and navigate with your mobile device's GPS technology. iPhone, iPad, droid phones, and droid tables have the ability to preload a map while a data connection is available, and then navigate on that map while offshore. All imagery is capable of being navigated on. This includes all overlay combinations. True Color Imagery: True Color imagery is fast becoming the "go to" choice for offshore anglers. The great thing about true color, is that it speaks for itself. Recent advancements in processing technologies allow us to offer custom processed true color images on a daily basis. Offering consistent timely true color was once a pipe dream, today it is a reality. We will continue to push the edges of what is possible here. Sea Surface Temperature (SSTs): With 4-12 updates per region, per day. We are unmatched here. We believe in the philosophy of making data available to you as soon as it is available to us. There is no waiting for us to hand select an image. You get all that is available, when it is available. Chlorophyll Imagery: This imagery shows the level of chlorophyll in the water. The less chlorophyll present, the clearer the water. We have done our best to correlate the color blue with blue water in your area. Altimetry Data: Altimetry data is sea surface height data. This data is updated daily. This data reflects the height of the sea in a given area. Higher seas levels (areas of red and orange) equal downwellings which are commonly considered void of live. Lower sea levels (areas of blue and blueish green) reflect upwellings which bring nutrients to the service. Target areas of transition between upwellings and downwellings. Coordinate Tool: This tool allows you to pinpoint the coordinates of a rip. Then just simply enter those coordinates on your boat's GPS. Zoom ability: We utilize the latest in zoom technology to help you quickly assess your target area to get the most out of your sea surface temperature, chlorophyll and true color images. Composite Imagery: Composite imagery is VERY important when clouds are present and intermittent. We provide daily and 3-day summaries which compile all available data from those days for SST and chlorophyll maps. WayPoint Manager: The RipCharts Waypoint Manager allows you to add and edit waypoints. We provide you with a base set of waypoints to work from, then you can add and edit waypoints as you please. This ensures that you have the exact information you desire. QuickSearch Navigation: This allows you to quickly search and scan all available imagery. Timely Data: Stop waiting for updates. We believe in the philosophy of making data available to you as soon as it is available to us. There is no waiting for us to hand select an image. You get all that is available, when it is available. 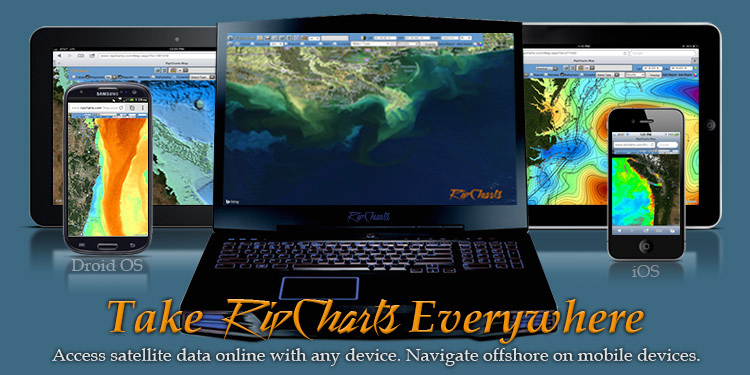 RipCharts.com provides real time satellite imagery including Sea Surface Temperature, True Color, Chlorophyll and Altimetry to offshore fisherman and enthusiasts to help them find the rip. By utilizing the lastest technology, Rip Charts is able to produce one of the highest quality online satellite fishing charts services on the market today. 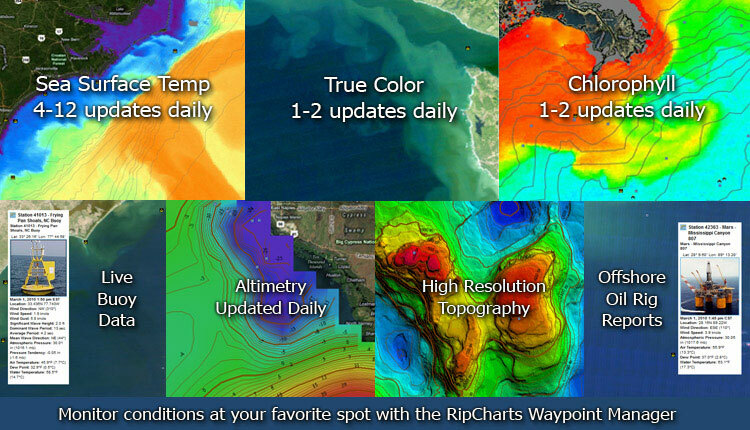 RipCharts provides real time sea surface temperature, chlorophyll, and true color maps. Feel free to contact us with any questions. We look forward to providing you the best satellite service possible at the best price possible while maintaining quality imagery.